Aardwolf is the common name for a small, insectivorous, hyena-like African mammal, Proteles cristatus, characterized by a dog-like appearance, hind limbs shorter than fore limbs, five digits on the forepaws, a mane along the back of the neck that can be held erect, several black stripes on the body and legs, and less powerful jaws than the similar-appearing striped hyena. While the aardwolf belongs to the hyena family Hyaenidae, it is the only extant member in the subfamily Protelinae, with the true hyenas belonging to the subfamily Hyaeninae. The aardwolf lives in the scrublands of eastern and southern Africa. These are the areas of land covered with stunted trees or shrubs. 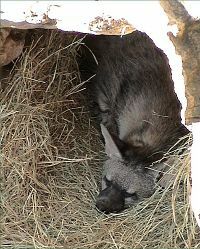 The aardwolf hides in a burrow during the day and comes out at night to search for food. While related to the hyenas, unlike its relatives, the aardwolf does not hunt large prey. This unusual animal is a mass killer-of insects. It feeds mainly on termites and can eat more than 300,000 in a single night, using its long, sticky tongue to collect them. Ecologically, the main role of the aardwolf is in control of termite populations, and as part of food chains, being itself consumed by larger carnivores, such as jackals. For humans, the control of the termites can be very important, as termites can be very destructive to farms. The extant members of the biological family Hyaenidae—the aardwolf and three species of hyenas—bear some physical resemblance to canids (family Canidae), but are most closely related to Herpestidae (the family of mongooses and meerkats). The aardwolf is the only surviving species of the subfamily Protelinae, while the other extant members of Hyaenidae belong to the subfamily Hyaeninae. The aardwolf sometimes is labeled as a hyena, since it belongs to the hyena family, but for this article it will be considered separate from the true hyenas (subfamily Hyaeninae). 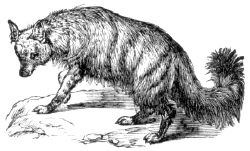 The aardwolf and all three hyena species have a distinctly bear-like gait and sloping posture due to their front legs being longer than their hind legs. The aardwolf, striped hyena, and brown hyena have luxurious, striped pelts, and manes lining the top of their necks, which erect when frightened. The spotted hyena's fur is considerably shorter and is spotted rather than striped. Unlike other species, its mane is reversed forwards. While the three living species of hyenas have among the strongest jaws in the animal kingdom, the aardwolf does not have such powerful jaws, given its diet consists mainly of termites, other insect larvae, and carrion. The front feet of the aardwolf also has five toes, unlike the true hyenas, which have four toes. 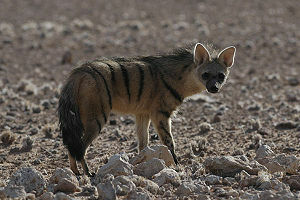 The aardwolf looks most like the striped hyena, but is significantly smaller with a pointier muzzle, sharper ears used for listening for harvester termites, black vertical stripes on a coat of yellowish fur, and a long, distinct mane down the middle line of the neck and back, which is raised during a confrontation to make the aardwolf's size appear bigger. The aardwolf is 55 to 80 centimeters (22-32 inches) long, excluding its bushy 20 to 30 centimeters (8-12 inches) tail, stands about 40 to 50 centimeters (16-20 inches) at the shoulder, and weighs between 9 and 14 kilograms ((20-30 pounds) (WFF 1994). Aardwolfs in southern Africa typically reaches to 9 kilograms (20 pounds), while those of East Africa reaches to 14 kilograms (30 pounds), with males and females weighing about the same (Grzimek et al. 2004). The aardwolf's teeth and skull are similar to that of the hyena, although the cheek teeth are specialized for eating insects, and its tongue for licking them up. As the aardwolf ages, it will normally lose some of its teeth, though this has little impact on their feeding habits due to the soft nature of the insects they consume (WFF 1994). The aardwolf has two glands at the rear that secrete a musky fluid for marking territory and communicating with other aardwolves. The aardwolf typically has a yellowish-white to rufous fur with several vertical black stripes on the sides, one or two diagonal stripes along the hind- and forequarters, and several stripes on the legs (Grzimek et al. 2004). Two geographically separate subspecies of the aardwolf are recognized: Proteles cristatus cristatus of Southern Africa and Proteles cristatus septentrionalis of eastern and northeastern Africa. The name aardwolf means "earth wolf" in Afrikaans/Dutch. It is also called "maanhaar-jackal" and "protelid." There are two distinct populations: One in southern Africa, and another in East Africa. The southern population is found in most of southern Africa as far as southern Zambia, southern Angola, and southwestern Mozambique (Grzimek et al. 2004). The northern population in East Africa extends as far north as the extreme southeast of Egypt and is separated from the southern population by about a 1,500 kilometer (930 mile) section of moist woodland (Grzimek et al. 2004). The species does not occur in the intermediary miombo forests. The aardwolf lives on open, dry plains and bushland, while avoiding mountainous areas. Generally, the aardwolf prefers grassy plains in the 100 to 600 millimeter (4 to 24 inches) annual rainfall range (Grzimek et al. 2004). Due to its specific food requirements, the animal is only found in regions where termites of the family Hodotermitidae occur. Termites of this family depend on dead and withered grass and are most populous in heavily grazed grasslands and savannahs, including farmland. For most of the year, aardwolves spend time in shared territories consisting of up to a dozen dens, which are occupied for six weeks at a time (WFF 1994). Aardwolf from the zoo in San Antonio, Texas. Aardwolves are shy and nocturnal, sleeping in underground burrows by day. They usually use existing burrows of aardvarks, Old World porcupines, or springhares, despite being capable of creating their own. At night, the aardwolf forages for food. Unlike other hyenas, the diet of the aardwolf almost completely consists of termites, other insect larvae, and carrion (WFF 1994). In particular, they feed almost exclusively on termites. An aardwolf can consume nightly up to 300,000 harvester termites using its sticky, long tongue (Morton-Matcham and Arbogast 2005). Rather than digging into the mound, they wait for the termites to move on the surface and consume them off of the ground (Morton-Matcham and Arbogast 2005). Aardwolves take special care not to destroy the termite mound or consume the entire colony, which ensures that the termites can rebuild and provide a continuous supply of food. They will often memorize and return to nests to save the trouble of finding a new one. As a aardwolf consumes a column of termites, the proportion of soldier termites increases, and worker termites decreases, and the soldier termites squirt noxious terpenes when attacked, which eventually becomes too much for the aardwolf and it terminates its feeding (Grzimek et al. 2004). The aardwolf in particular specializes on consuming one genus of snouted harvester termite, Trinervitermes (Grzimek et al.2004). They feed on members of this genus at night. However, in South Africa, during the cold winters, these termites become inactive and the aardwolf switches to feeding in the afternoon on the diurnal harvester termite Hodotermes mossambicus (Grzimek et al. 2004). Aardwolves also are known to feed on other insects, larvae, and eggs, and occasionally small mammals and birds. Unlike other hyenas, aardwolves do not scavenge or kill larger animals. The aardwolf is primarily solitary (especially males), but a mating pair will occupy the same territory with their young. Young aardwolves generally achieve sexual maturity after two years, and the breeding season varies depending on their location, but normally takes place during the autumn or spring. During the breeding season, male aardwolves will search their own territory as well as others' for a female with which to mate. This can often result in conflict between two male aardwolves when one has wandered into another's territory. The male aardwolf helps to raise the young by guarding the nest; however, since dominant males frequently will mate with the females of less dominant males, the cubs may be protected by the cuckolded male. Gestation lasts between 90 and 110 days, producing one to five cubs (most often two or three) during the rainy season, when termites are active. The first six to eight weeks are spent in the den with the mother. After three months, they begin supervised foraging and by four months are normally independent. However, they will often use the same den as their mother until the next breeding season. Aardwolves can achieve a lifespan of up to 15 years when in captivity. The aardwolf has taken advantage of the development of agriculture in the continent.They are often considered useful, non-dangerous animals by farmers. However, in some areas the aardwolf is hunted for its fur. Encounters with dogs are another threat. Grzimek, B., D.G. Kleiman, V. Geist, and M.C. McDade. Grzimek's Animal Life Encyclopedia. Detroit: Thomson-Gale, 2004. ISBN 0307394913. Morton-Matcham, M., and B. Arbogast. Proteles cristata. Animal Diversity Web. Retrieved November 24, 2017. Wildlife Fact-File: Animal Identification and Conservation Guide (WFF). IMP Publishing, 1994. ISBN 0600450120. This page was last modified on 20 January 2019, at 17:07.